For as long as there has been golf at Pinehurst, there has been a thriving caddie program. 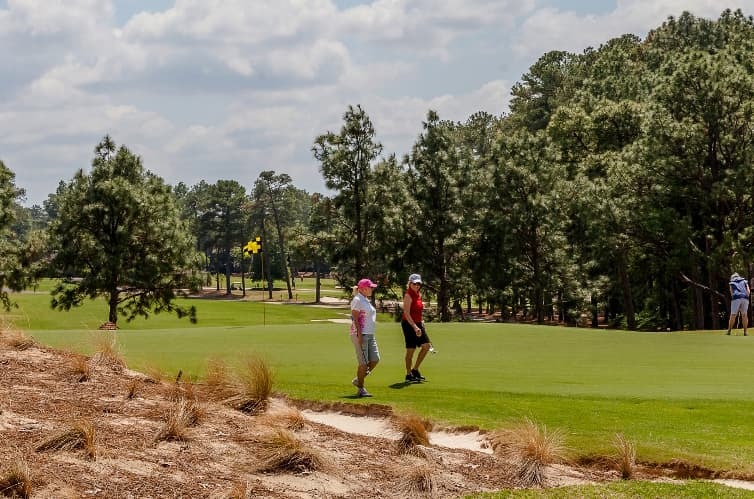 Pinehurst Resort and Country Club, in conjunction with CADDIEMASTER®, is honored to announce the second class to be enshrined into the Pinehurst Caddie Hall of Fame. In a ceremony on Dec. 5 in the Pinehurst Resort Clubhouse, seven new members were inducted, celebrating the careers of Jesse Jones, Charlie Spain, John Ross, Bobby Hill, Robert Scheirer, Thomas Trinchitella and caddiemaster Jimmy Smith. They will join the inaugural class from 2001, which included, among others, such Pinehurst legends as Jimmy Steed, Fletcher Gaines and Willie McRae. Over the last century and more, Pinehurst’s caddies have witnessed some of the greatest achievements and moments in all levels of golf. They have walked with the very best players ever to play the game, and they have been by the sides of the many guests and members who make this such a special place every day of the year. The new class includes four caddies currently working the grass at Pinehurst. Ross has been caddying at Pinehurst since 1954, a staggering 64 years. No caddie currently at Pinehurst has worked longer. Scheirer won the 2008 U.S. Amateur on the bag for Danny Lee, who at the time was the youngest to win the Amateur. Scheirer has also helped two players to North & South Amateur titles. Trinchitella has trained more than 80 percent of the caddies who have come through Pinehurst since 2001, and regularly travels the country training more. Bobby Hill has been at Pinehurst since 1984 and is considered one of the best greens-readers in Pinehurst history. Francis “Jesse” Jones was soft-spoken, but was considered a giant among the caddies of Pinehurst, with few understanding the subtleties of No. 2 better. Jones passed away in 2015. Spain was considered another gentle soul who caddied at Pinehurst for decades. Not long before his untimely passing in 2017, Spain had invented the “Flat Cat” putting grip, which is used by several PGA Tour professionals today. Smith came to Pinehurst as a caddie in 1998, quickly ascending to caddiemaster in 2000. A former golf professional, Smith becomes the second caddiemaster to be enshrined into the Pinehurst Caddie Hall of Fame, joining Jack Williams, who at the height of the Pinehurst caddie program would oversee as many as 500 caddies a day. A member of the inaugural Hall of Fame class in 2001, Jimmy Steed won three North & South Opens as Sam Snead’s caddie in the 1930s and 1940s. Steed died in 1985, and his family was unable to be located for the first ceremony in Pinehurst 17 years ago. On Wednesday, Steed’s niece Connie West was on hand to celebrate Steed’s career. Todd Camplin, a former Pinehurst golf professional who had Spain on his bag during the 2011 PGA Championship, told of one harrowing moment he and Spain – who was missing two fingers on his right hand – shared on one of golf’s biggest stages.